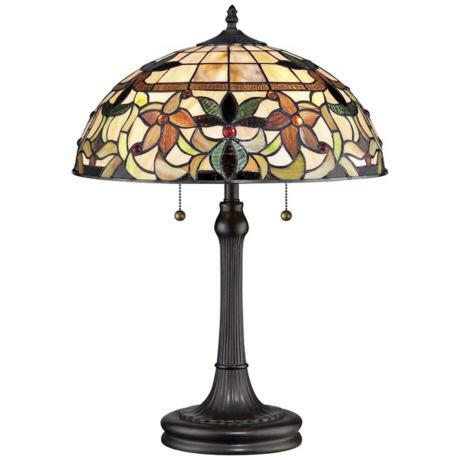 Add a soft glow to any space with this beautiful Tiffany style table lamp. The stunning art glass lamp shade is comprised from 348 separate pieces. While a dark resin base adds a warm touch to the design. Two pull switches offers a traditional touch. 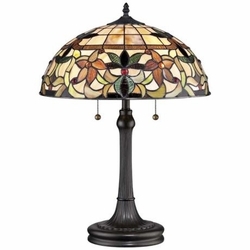 Tiffany style table lamp design from Quiozel. • Tiffany style table lamp. • A table lamp by Quoizel lighting. • Maximum two 75 watt bulbs (not included). • Shade is 8" across the top, 16" across the bottom.